Purpose: The aim of this study was to investigate disease onset and disease progression in patients with severe chronic central serous chorioretinopathy (cCSC). Patients and methods: The medical records of 143 cCSC patients (199 eyes) were reviewed. 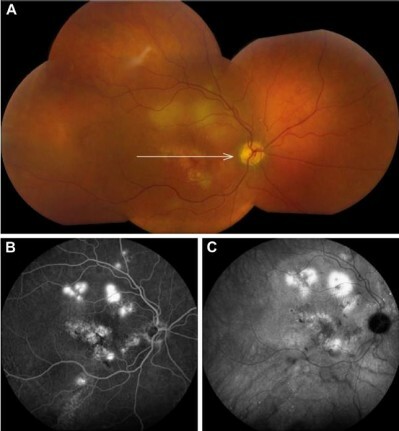 All cases had visual complaints for >6 months and showed signs of a severe disease phenotype on optical coherence tomography (OCT) and fluorescein angiography (FA). Clinical presentation at onset was evaluated, together with disease progression on multimodal imaging and final treatment outcome. Results: Twenty-eight cases (14%) had a documented history of an acute episode of CSC, whereas 145 cases (73%) showed pre-existing features of chronicity already at first presentation. The first clinical presentation could not be evaluated in 13% of cases. Best-corrected visual acuity (BCVA) was 70 ± 18 Early Treatment of Diabetic Retinopathy Study (ETDRS) letters at onset and 70 ± 22 ETDRS letters at final visit (p = 0.770). Among all studied cases, 173 eyes (87%) were treated, which resulted in complete resolution of subretinal fluid (SRF) in 76% of eyes at final visit. In eyes with fluorescein angiographic follow-up, the area of diffuse atrophic retinal pigment epithelium (RPE) abnormalities (diffuse atrophic RPE alterations [DARA]) had increased significantly in 43 eyes (68%) at final visit. Conclusion: CSC encompasses a clinical spectrum that includes a range of severe phenotypes, in which retinal abnormalities tend to be progressive. Nevertheless, the long-term visual acuity may remain fairly stable with treatment. Few patients with severe chronic CSC have a history of acute CSC, which could indicate that there may be pathogenetic differences between these 2 CSC variants.